For Sale: Radio Wiring Harnesses for SVX!! If you do any searching you'll soon find that nobody makes a wiring harness that fits the SVX. After considerable effort, I have put together one that does fit. Mine is equal or better than what the harness manufacturers would have made had the SVX had been produced in larger numbers. I've been purchasing parts to make harnesses in small production runs and am selling them to SVX and other Subaru owners. Yes, all harnesses are available! I will update this thread if/when I ever stop making these. and e-mail me the information requested. Send your order or inquiries via E-MAIL to: 96svx.dc@gmail.com. I may not reply to PMs or follow-up postings here nearly as quickly. I try to reply by e-mail the same day, but it can sometimes be longer due to the amount of time it takes me to respond to the many inquiries I've been receiving lately. If you don't hear back from me within 4 days, please resend your message — I've had reports that some of my replies have not been delivered. You should also check if your e-mail provider placed my reply into your "spam" folder. If you still don't hear back from me, go ahead and try a PM here (but please include your e-mail address in your PM). SVX 'forward' harness $12 — Mates with the SVX's radio plug (all model years, all markets except Europe). Use this to install a new radio in your SVX (either an aftermarket or a newer Subaru radio from another model). Simply solder or crimp this harness to the harness that comes with your new radio. This has the 20-position connector shell with 15 pins/wires and allows you to install a new radio without cutting or splicing into your car's factory wiring. SVX reverse harness $15 — Plugs into the SVX factory radio. Use this to transplant an SVX radio into another car, or to restore your SVX's radio wiring harness if it was removed by a previous owner or car stereo installer. Currently, this is only the 20-pin radio plug (with 15 pins/wires); I'm still looking for the shell for the 2-pin illumination plug for the CD player, but can include those two extra wires with contact pins for an extra $1. 14-pin reverse harness $12 — Plugs into a factory radio from many other 1993-2007 Subaru models besides the SVX (Impreza/WRX/STi, Forester, Legacy). 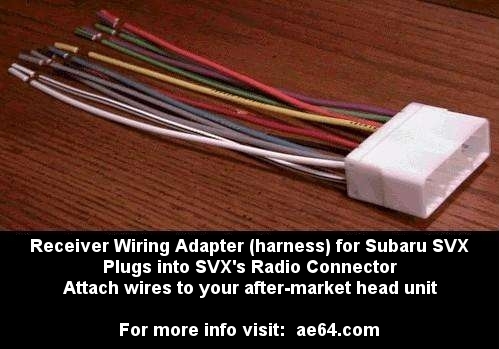 Use this to install another Subaru radio in your SVX (solder or crimp this harness to an SVX 'forward' harness). 2-DIN sized WRX and Legacy radios have been popular with SVX owners because they're slightly newer but still look stock. Also see the SVX-to-14 pin adapter, below. 14-pin 'forward' harness $10 — Mates with the radio plug in all 1993-2007 Subarus (besides the SVX), and some 2008-up. The after-market harness manufacturers have these, but theirs frequently lack the Dimmer wire (necessary for Subaru radios to light up properly). WRX owners who want to install a Line Output Converter (LOC) for amps or a subwoofer can use this with a 14-pin reverse harness. Reverse subwoofer harness $12 — Harness with 8-position connector that plugs into the Subaru factory under-seat subwoofer. Use this to install a Subaru subwoofer in another car (you'll also need forward and reverse radio harnesses for that car), or to repair a damaged factory subwoofer T-harness. Forward subwoofer harness $10 — Harness with 8-position connector that connects to the Subaru factory subwoofer harness. Use this to connect an after-market sub or amp to the Subaru subwoofer harness. Send e-mail for more info. SVX Alarm connector — Mates with the SVX's factory keyless entry/security system plug. This will enable a plug-and-play installation of an aftermarket alarm system in your SVX! Please send e-mail for details. SVX Car Phone Power Harness $5 — Mates with the power connector located in the SVX's trunk (intended for an ancient-style mobile phone transceiver unit). See this thread Handy source of Ground, +12V Battery, Accessory, and Ignition. Could use to power a small subwoofer, trunk unlock solenoid, or other electrical projects. Select Monitor Harness $5 — Mates with the Select Monitor connector found in many Subaru models (including SVX). See this thread (probably other threads exist by now too). 18-inch antenna extension cable $3.00 (with any harness order) — Male to female extension cable with Motorola connectors. Needed by most radios to reach the SVX's antenna cable. SVX-to-14-pin Plug-and-Play Harness $32 — By popular demand, a ready-to-use harness with SVX forward and 14-pin reverse connectors. Install a newer Subaru radio in your SVX with no crimping or soldering required! Far less bulky than separate SVX and 14-pin harnesses wired together. Older Subaru two-piece radio harness with 7- and 9-pin connectors $10 — Used in European SVXs, and other 1994 and older Subarus. 20-pin forward and reverse harnesses — fits most 2008-up Impreza, 2009-up Forester, 2010-up Legacy/Outback. E-mail is the best way to contact me. See information in green, above. Last edited by SVXdc; 01-01-2016 at 04:21 PM. 1) Link to my SVX Audio Installation guide (click link). Shows how to remove the radio without scratching up your dash, has a wire color chart for the radio harness, and includes many other useful tips. 2) If you are installing an after-market radio in your SVX, then you want an SVX "Forward" harness. 4) Yes, I still have these harnesses available. I will update this thread when I stop making them. 5) Yes, my SVX harnesses fit all SVX model years (1992-1997). But you should compare your car to the pictures in my locker (click here) to be sure your factory radio plug was not removed by a previous owner or car stereo installer. 6) The SVX radio harness is different than the harnesses in all other Subaru models. 7) No other company makes or sells radio harnesses for the SVX. 8) Because of #7, no stereo install shops will have these harnesses. If you ask them to install a radio in your SVX, they will want to cut off your car's radio plug and do a "hard-wire" install. Even if you want to have a shop do the work, you'll be better off if you get a harness from me first. But take a look at my SVX Installation Guide -- you may find that you can do it yourself. At worst, you may just need the shop to solder or crimp the harnesses and then you do the rest. If you still want them to do the install, tell them the highlights from the guide so they can avoid the pitfalls (opening the dash, avoiding scratching things up, finding the antenna connectors, etc.). 9) If you're in the Atlanta area (or passing through), I'd be happy to sell you one in person. Send me an e-mail to arrange to meet. I'll also bring some to any SVX or Subaru meets that I attend. If you haven't bought anything from Crutchfield before (at your current address), and would like $20 off your first order over $200, e-mail me for a referral code. In gratitude of the wealth of information the subaru-svx.net website has provided me, I am donating 50 cents to this site from each sale. This site welcomes any donations to help defray operating costs. For more information see this page: Donation Instructions. You might also like to read Aredubjay's post from 2002 which gives some history about this site and remains a compelling call for continued donations: "The State of The Network" (but please see the new link above for the current places/methods to send donations). Last edited by SVXdc; 12-17-2014 at 08:12 PM. I've added a photo of the SVX's radio connector (what's wired into the car) to my locker. Edited 1st post above to point to that instead of the pic of the rear of the factory radio. It has many new pictures and doesn't talk about snipping the antenna wires anymore . Last edited by SVXdc; 12-08-2005 at 12:06 AM. Ok guys. This wiring harness is PERFECT! Ordered it last Friday, got it on wed, installed it tonight. His docs are great, and it's a quality harness. Well worth the $ I spent on it! Thanks a million, took a many hour job become 1 hr job! Hello all, I just got the adaptor and wanted to let everyone know that the item arrived as promised, and it's exactly like the other "Professional" harnesses I've used before. Thanks for the quick delivery David. I just put this harness together with a WRX harness and it went together perfectly. It was easy to use and everything was clear. David sent out the order the instant he received the payment and I had received the package as promised. I cannot stress how good this harness is. It is perfect and there are no problems. For those that have cut the factory harness, sorry but you have lost quite a bit of flexibility in future swaps. This is a must have if you want to change headunits to anything else. I hope David that you can keep these harnesses going. I know that there are many that will want them. I don't have the funds for a new receiver (going upscale style) so I was wondering if iI should just get that now?... How long will you be making these/how many do you have? I was wondering if I should just get that now?... How long will you be making these/how many do you have? I don't want to make this a lifetime occupation, but I expect I'll order the parts a few more times, until it becomes too much of a hassle. If you know you're going to install a new radio, but aren't going to do it soon, I would recommend that you tell me via e-mail. Then if I get down to the last few and it looks like I won't make any more (or there will be a long delay), I'll give you the first chance to buy one before I let someone else have it. Last edited by SVXdc; 01-20-2007 at 05:15 PM. I got one of these, the product looks great and the redone instructions will be a big help too! I'm looking forward to getting a new headunit much more now! So.... any progress on dash LED's? compare to the one you are offering? Are they basically the same? Anyone know? That harness does not fit any SVX. It is made by Scosche, who up until recently listed that part in their catalogs as fitting the SVX (as well as other Subarus). They finally changed the listing for SVX's to "no fit" in their latest catalog. J.C. Whitney copied the incorrect information, and hasn't updated their own catalog yet. UPDATE: J.C. Whitney finally pulled the bogus "SVX harness" from their catalog. If you search through older posts, you'll see that SVX owners have ordered this part from J.C. Whitney and when they got it found that it did not fit. Believe me, if it were available elsewhere, I would not have spent the time to make them myself! Last edited by SVXdc; 12-11-2004 at 12:39 AM. I don't "plan" on replacing my unit, but, I'd like to have one as a "CYA" measure. Gotta have my tunes, if the stock unit goes out and I can't find another, I'll need to do SOMETHING. Let me know when inventory gets low, or, if you're planning on ceasing production. I'd like to snag one. Thanks again for your fine work on this project. It's certainly great to have members who are willing to put their time, efforts and monies into filling a need and passing on the results at a reasonable price. They still for sale?, i am getting a new SVX and would like to put my HU in with it till i rewire the whole cars speaker system.